Erykah Badu is undoubtedly one of the world’s most celebrated contemporary artists, and her headline performance on Friday 1st June in Brockwell Park will be an emotional foray into her soulful musical talent. The Grammy-winning soul singer is one of the most celebrated performers of the modern era since her seminal debut album Baduizm earned her legions of loyal fans, sold millions of copies – and in 2017 celebrated its 20th anniversary. Friday’s line-up also features Stones Throw’s prolific beatmaker Madlib; multi-talented jazz saxophonist Masego; and Ninja Tune’s Jordan Rakei with his soulful, jazz and hip-hop driven sound. Lambeth local Loyle Carner will also perform. 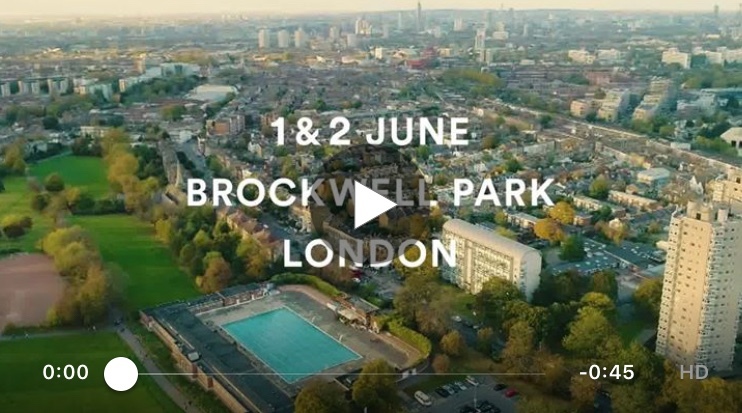 When told Field Day would be upping sticks and moving to Brockwell Park the rapper’s response was simply “It’s about time”. The Barn, which makes its return just for the Saturday, will also host an unmissable performance from shapeshifting producer Four Tet. His place as one of the finest contemporary electronic musicians is hard earned and his 2017 album New Energy saw a reimagining of his early work. Bass wizard and master of jazz, Thundercat, also performs on Saturday. His talents have lead to collaborations with Field Day headliner Erykah Badu as well as Kendrick Lamar and Pharrell Williams, and last year’s album Drunk, one of Rockshot Mag’s albums of the year, proved to be his most successful to date. A true professional when it comes to live shows, Thundercat will be a highlight of the weekend. 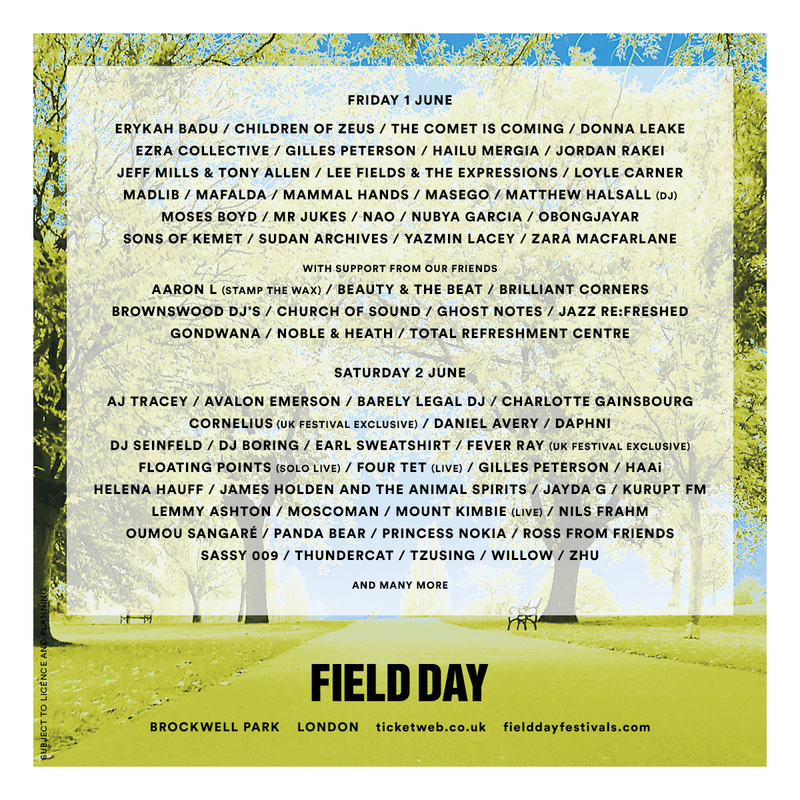 Another icon of electronic music, Fever Ray, will perform the Saturday at Field Day in a UK festival exclusive. After eight years since her almost-supernatural self-titled debut, the former lead singer of The Knife made a triumphant return last year with Plunge and is certain to be one of the most thrilling shows of the weekend. Saturday also sees Princess Nokia return to South London. The New York native is one of the fiercest rappers on the planet. Her performances are a call to action, punctuated by rallying cries against bigotry and misogyny. There’s no doubt that her unapologetic attitude and incredible talent has earned her well-deserved critical acclaim and a dedicated fanbase. Poised for new music in 2018 is former Odd Future collaborator Earl Sweatshirt, who makes an appearance at Field Day, and London’s-own rising rapper AJ Tracey will perform the Saturday. XL Recordings’ finest, fictional radio station MCs Kurupt FM join the line-up, plus appearances from the achingly cool Charlotte Gainsbourg and a live performance from producing power duo Mount Kimbie. The bill also includes German composer and pianist Nils Frahm, trail blazing producer Floating Points with a solo live show, The Comet Is Coming and Grammy award-winning Oumou Sangaré. Fellow Mancunians join the bill in the form of hip-hop laced EzraCollective and Children of Zeus. Tickets are on sale via the Field Day website www.fielddayfestivals.com.